High above 2nd Avenue in a tower of marble and hardwood, our delegation was met with a warm welcome and a hot meal at the Nigerian Permanent Mission to the United Nations. 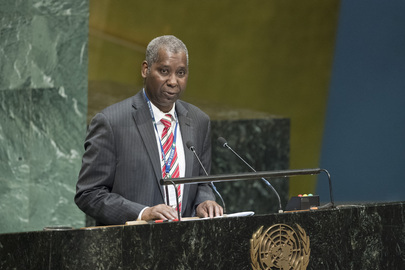 The Ambassador of Nigeria to the United Nations, H. E. Prof. Tijjani Muhammad-Bande, was especially eager to welcome us as representatives of McGill, having earned his Ph.D. in Political Science in 1987 right across the way at the University of Toronto. We were joined as well by H.E. Mr. Samson Sunday Itegboje, Deputy Permanent Representative, and Mr. Alexander Temitope Adeyemi Ajayl, Minister of Third Committee Affairs. Before our audience began we informed them that Nigeria was the only African Permanent Mission we would be visiting for CSW63. The Permanent Mission staff joked in reply that by meeting with them, Nigeria, we were “meeting with all of Africa.” While this statement was humour, it’s ethos turned out to become the crucial, central theme Ambassador Muhammad-Bande would try to convey throughout our meeting –as Africa’s largest country by both population and economy, Nigeria first and foremost speaks for Africa on the world stage. The Ambassador explained that Afrocentrism in Nigeria began with their independence in the 1960s, and now being Africa’s biggest country this manifests as the ubiquitous responsibility Nigeria feels to advancing the interests of Africa as a whole. Nigerian demographics were quick to come up during our discussion, in particular the median age of roughly eighteen years –an amazingly low number compared to much of the world. “The youth bulge,” Ambassador Muhammad-Bande stressed, “is either a resource or a problem,” depending entirely on how Nigeria acts on it. In recognition of this, the government has made efforts to expand the political sphere for the greater engagement and mainstreaming of youth into politics. Results can already be seen in the increasing numbers of youth candidates running in elections. A further investment Nigeria has made in their future is free education at the primary school and secondary school levels; regardless of gender. The Ambassador expressed his hope that the inverse relationship between education and fertility levels will work to mitigate population levels in the future. The Nigerian officials also wanted to highlight the strides made towards gender equality in recent years, such as new programs teaching women hard skills such as accounting, new scholarships for women pursuing STEM careers, and new initiatives such as the NPower program that facilitates job acquisition for both graduate and non-graduate Nigerians.